Dozens of cats were seized from a home in Mountain's Edge on Thursday morning. Pictures show animal control officers wearing hazmat suits to go inside. County authorities confirm an investigation is underway. Joseph Valle snapped pictures of Las Vegas police officers and animal control officers outside the home on Weeping Water Avenue. 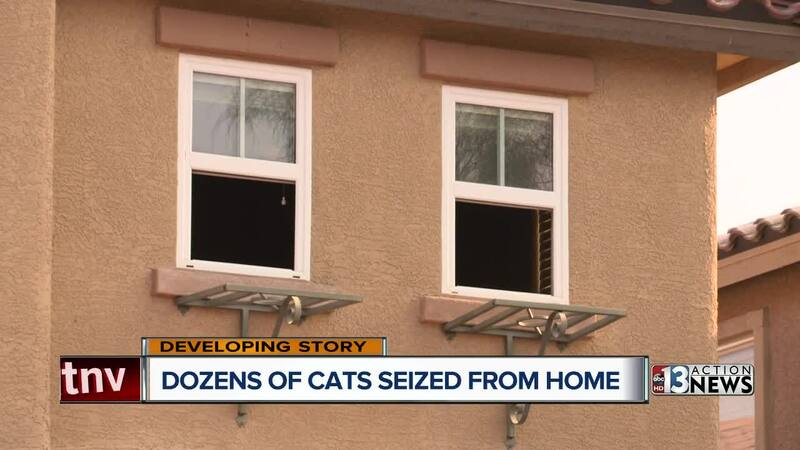 "Finally today animal control showed up and took away a large number of cats," Valle said. The Animal Foundation confirms it received 44 cats Thursday afternoon, but began getting animals from the home on Tuesday. There were 51 in total. "It bothers me because I have been able to smell the stench and odor as a result of cat and dog droppings," Valle said. Besides the odor there were the trash piles of aluminum cans in the breezeway and trash up to the windows of a vehicle in the driveway. Valle says he and other neighbors recently called paramedics after finding an older woman in the driveway unable to move. "I could tell just by looking at her she wasn't in good health," he said "And that day I realized how desperate the situation was." 13 Action News tried to speak with someone living at the home, but no one answered the door. The homeowner association responded to our request for comment Friday. Mountain’s Edge Master Association exists to preserve the nature and character of the community, while providing services and amenities to residents that connect people, protect and enhance property values, and create neighborhoods that truly feel like “home.” The concerns and issues that matter to the residents of Mountain’s Edge are of utmost importance. The Association has just been made aware of the situation and is gathering information. Our organization will cooperate fully with the authorities regarding this matter. The Animal Foundation released photos of a few of the cats that were seized on Friday afternoon.